Once again the Sandbar sponsored a team at the Spurling Scramble, the sixth annual golf tournament put on by the Lawrence Police Officers Association, Fraternal Order of Police and International Association of Firefighters. This year's event was held last Thursday at Alvamar. Proceeds from the event benefit a family or organization in need. Team Sandbar consisted of staffers Tegan, Joe, Nathan and Tyler. Dave dragged himself out of bed early to be there at 7:30 a.m. with thermoses full of hot chocolate and bottles of Buttershots. He didn't golf, but he happily handed out shots and hung out with Karen and Kalissa. According to the golfers, the "Factor" was in full effect that day. If you don't know what that means, you need to spend more time at the Sandbar. Since I publicly committed to blogging daily here during January, and since I've kind of run out of things to write about (for now), I put out a plea to the staff. I sent them a list of random questions and begged them to answer them so I could profile them here. Danny was the first (and so far the only) one to answer me. Way back in 2007, we profiled Danny for the first time. A lot of things change in three years...and some things don't. Most unusual drink request? Calimocho...red wine and cola equal parts...shockingly enough I already knew how to make it because of a guy I met in the climbing club at KU who was from Spain. The lady that ordered it was equally shocked that I didn't need any clarification. Favorite memory at the bar: I worked a SLOW Tuesday and Bill Self made an appearance. While he was there he bought 2 bottles of Miller Lite and tipped me $20 for each one. If only everyone tipped that way! Tell us a funny story from the bar: Sandbar Christmas party 2009...Hayley gave me a wedgie, and when I feigned that I was going to retaliate, she yelled for help...Joe, who was behind the bar, quickly responded by spraying me in the face.....with Sprite. I was still sticky when I woke up the next morning. Good times. Other things Danny does when not working at the Sandbar: Nursing school, running, fundraising like a bat out of hell for MS (http://main.nationalmssociety.org/site/TR?px=3998975&fr_id=16072&pg=personal), pretend musician for $ellout! What staff member do you want to learn about next? Less than two weeks until our big bash! We hope you're as excited as we are. Like the artwork? The theme of our party is "Finally Legal," since the bar's turning 21 and that's the birthday almost everyone looks forward to. Joe the now-former bartender was drafted to create some fancy artwork for us, and the picture above is what he came up with. It's been modified into a fantastic t-shirt design, which we'll unveil soon. 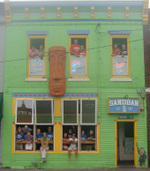 The street in front of the bar will close at 1 p.m. on Saturday, August 14. We need time to get everything ready! The bar will still be open, of course, but you'll have to excuse us while we run around like crazy people. The beer garden will open at 5 p.m. There will be a cover charge and you have to be 21 to enter the beer garden. You'll have to go through the beer garden to get inside the bar. We'll have beer service outside in the garden- with more staff than last year so hopefully the wait for a drink won't be quite so long. Live music! We'll have three bands this year. Stomper, made up of our neighbors next door at Richard's Music Company, will be back this year to kick things off around 5 p.m.
At around 6:30, Katlyn Conroy and the Wild and Wooly will take the stage. For those of you who don't know, Katlyn is Peach's niece- the daughter of Peach's brother Patrick, who she bought the Sandbar from many years ago. Katlyn is also a very highly acclaimed singer, songwriter and musician. We're excited to have her play at our party- our way of keeping it in the family! At 8 p.m., the Sandbar float dancers will entertain the crowd for a few minutes. Finally, our headline act Mark Valentine and the Ones will play all our favorite cover songs until midnight. This event is free and family-friendly. Kids are welcome to come dance in the street! No alcohol is allowed outside the beer garden. There will also be water, soda and food available for purchase. All of our neighbors have graciously given their support for this party. Please support their businesses, too! It wouldn't be a Sandbar party without some extravagant surprises, so we won't reveal everything here. You'll just have to come out to our party and experience it all yourself! The Joe Factor is leaving the Sandbar. Joe's lovely fiancee Teresa graduated from Washburn Law in May, and she's taking the bar exam this week. While she's been studying all summer, Joe's been living it up at the Sandbar and at manager Dave's backyard pool. But now, Teresa has landed a job in the metropolis of Emporia, and they'll be leaving Lawrence soon. Wednesday is Joe's final regular bartending shift at the Sandbar. I say "final regular," because we certainly hope he'll come back to visit and make a guest appearance behind the bar or at the door. Come join us on Wednesday night and wish Joe well in his new adventures in Emporia. Some of the staff in "Cuddle Island" with Joe. That's how much they'll miss him. Share your favorite Joe Factor memories and moments in the comments! Dave, Andrew and Frank left Kansas City on a Friday. Joe took a different flight out of KCI that day, and he was flying alone because everyone else was scared to take the same plane had conflicts with his schedule. Here's where "the Factor" struck. As Joe's plane approached the Denver airport and attempted to land, a microburst hit. And you thought microbursts were made-up weather occurrences that only hit Lawrence! This one apparently hit the plane, because Joe said people were tossed around and getting sick and everything. The plane was diverted to Colorado Springs because the FAA issued a ground stop at the Denver airport. The plane was almost out of fuel and couldn't go to another airport or continue on to Vegas. Joe said they were stuck waiting in the plane for four hours before refueling and flying back to Denver. Joe finally made it to Vegas on Saturday, where he happily celebrated with Dave, Andrew, Frank and twenty of his closest friends. We love you, Joe, and we're glad you're home safe now.